BioWare has been releasing premium modules for Neverwinter Nights for over a year now. The first modules were short and fairly basic affairs, modules that any fan of the game could have created. Since then, the trend has been for the modules to get longer and more complicated (and more expensive), relying on new tile sets and patches for the game. But while the modules are getting more sophisticated, are they getting any better? Fans of the modules might say one thing, but from what I can see, the answer is no. 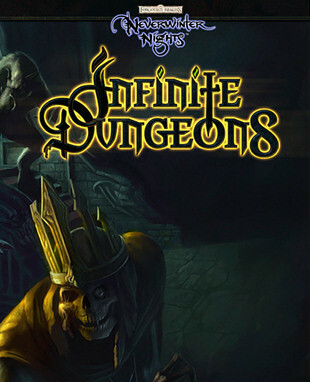 Infinite Dungeons is the fifth premium module. As its name suggests, it is all about replayability. When you enter the module (with any character between levels 5 and 40), random dungeons are created for you. If you want, you can tune the dungeons to your class, so, for example, a rogue character would see more traps and secret doors, and find more light armor and weapons. You can also leave the dungeons balanced, so that your character would see the full assortment of equipment drops and dungeon styles. There isn't really a campaign to Infinite Dungeons. At the start of the module, you meet a creepy kid named Timmy who introduces you to the dungeons. You learn that there is an evil mage named Halaster who controls the dungeons, and so your goal is to eventually defeat him. To reach Halaster, you have to venture into half a dozen random dungeons. The format of each dungeon is the same. Each level of the dungeons contains a grid of map areas, and somewhere on the bottom level you have to deal with a boss creature so that you can move on to the next dungeon. Along the way you encounter random monsters, meet random shopkeepers, and trigger random quests, and so each time you play, the module is different. That's the good news. The bad news is that Infinite Dungeons is a pretty boring slog. The first dungeons you enter contain two 3x3 levels, and so they're relatively quick to navigate. But then the dungeons start getting bigger and bigger, and it starts taking longer and longer to move through them. I finally gave up on the module after the fifth dungeon, which contained four 5x5 levels. By the end of that dungeon, the module was keeping track of so many map areas that saves and loads were taking almost five minutes each, and while the map areas are random, they're also fairly similar (each dungeon has a theme), and I got bored fighting the same assortment of creatures over and over (I must have killed over 500 beholders in that fifth dungeon), not to mention frustrated with all the waiting I had to do with the saves and loads. Another problem the module has is that in trying to make Neverwinter Nights more like an action role-playing game, the designers added a system where players can find random equipment, and where they can use recipes to add extra effects to equipment. That probably sounds good (since it's basically what Diablo and similar games do), but it actually causes all sorts of problems. The basic Neverwinter Nights equipment was carefully designed by BioWare, and so, for example, you'd rarely see damage resistances on anything but belts, meaning that it was difficult to resist more than one type of damage at once. But in Infinite Dungeons you can find resistances on everything, and you can add in more resistances using recipes, and you can even add in things like regeneration and haste. At level 10 I found a +2 soak 30 item, and, coupled with everything else, I was almost immune to damage. Every so often a beholder would beat my saves and instantly kill me, but otherwise the overpowered equipment meant that the module was no challenge at all to play. I can picture some good uses for the technology developed in the Infinite Dungeons module. If you're given a quest to rescue a damsel from a tower, for example, then you could make the tower random, so that the module is always a little different. But you can't just have the campaign be one big random tower, and expect players to get excited about it. You need the random tower to be part of a larger, partially fixed campaign. Infinite Dungeons doesn't try to do that. It doesn't have any interesting characters (other than Timmy), it has zero storyline, and it could have achieved about the same result by regularly spawning random creatures in a single room. I could see some people enjoying the module, and being happy about finally having a place to play their Hordes of the Underdark veterans, but for me the module was a total bore, and I enjoyed it not at all.